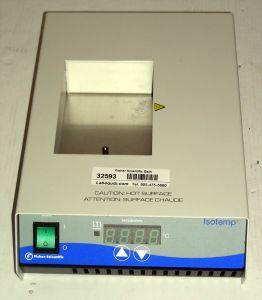 Product Description This Fisher Scientific Isotemp 2001FS microprocessor controlled digital dry block incubator has a temperature range of 5C above ambient to 130C. Holds 2 interchangeable heating blocks (not included but can be ordered new at additional cost). ±0.4C uniformity and ±0.2C stability at 37C.